I stayed in the Barbarella Suite in Napoli, alternatively there are over 2000 hotels to choose from in the city. Stadio San Paolo is located to the east of Naples. You can reach it on the Naples Metro. 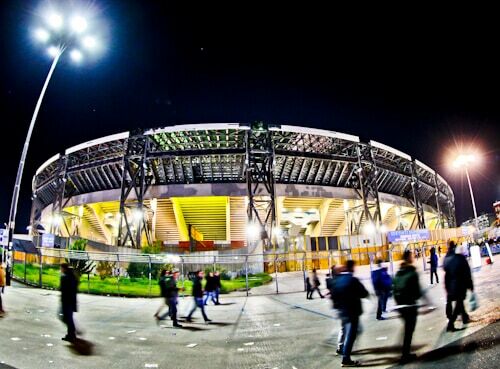 The historic Stadio San Paolo played a major part in the Italia 90 World Cup. An interesting fact about the stadium is that they wanted to change the name. The desired name was the Diego Maradona Stadium but this was denied. In Italy you cannot name a monument after someone until they have been dead for over 10 years. Although this is a historic stadium, if you travel further east there’s a stadium with a lot more history. Naples has it’s own Flavian Amphitheater called Pozzuoli. It’s comparable to the Colosseum in Rome. 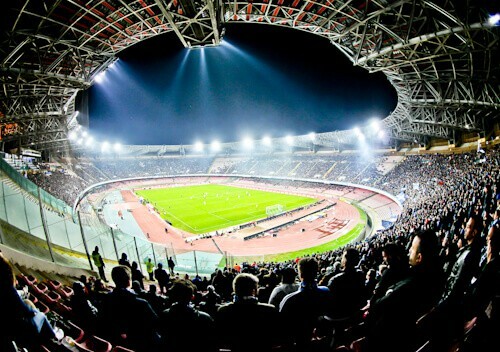 Stadio San Paolo is the 3rd largest stadium in Italy after the San Siro in Milan and the Stadio Olimpico in Rome. The capacity is just over 60,000 spectators. 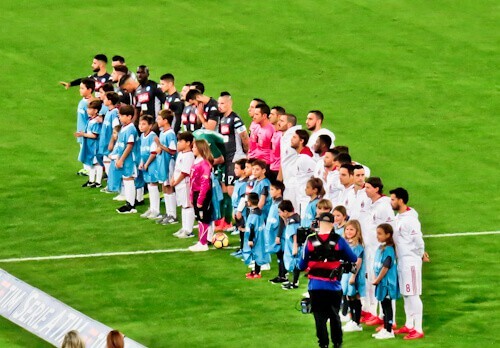 I watched Napoli versus the popular AC Milan and there were lots of empty seats. This means you will be able to find a ticket easily. The most famous match ever played in this stadium was Italy versus Argentina in the Italia 90 semi final. It was made extra unique as Diego Maradona was playing and he is a legend for the Naples fans. The fans were loyal to Italy but it was Maradona who scored the winning penalty! In addition, this is the stadium where England beat Cameroon in the quarter finals. Part of the fun of watching a live match is seeing the teams warming up. After they have warmed up they will return to the dressing room. Then the teams music will play as they run onto the pitch. The music playing was ‘Burning Heart’ by Survivor from the Rocky movies. The teams come out with mascots, which are young children (above). If you’re watching the match with young children you could email Napoli beforehand. Maybe it’s possible for your children to be mascots for the day. 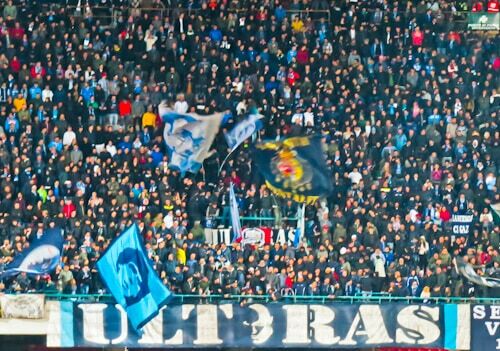 The Napoli fans are known as Ultras. These are not the friendliest of people. It’s advisable to keep a low profile whilst watching Napoli. Flares, although banned, are lit frequently throughout the match. The away fans were protected by a huge netting and positioned well away from the Ultras. Having said this the Ultras still managed to fire flares towards the away seating. I was watching this match at a difficult time for Italian football. They had just failed to qualify for the world cup. In the match against Sweden they failed to win, many blamed the manager for not bringing on the Napoli striker, Lorenzo Insigne. During this match, Lorenzo Insigne scored first, piling more blame on the Italian coach. Napoli went on to win the match 2-1 and remained leaders of Serie A. To get to Stadio Sanpaolo you can take the Cumana line of the metro. 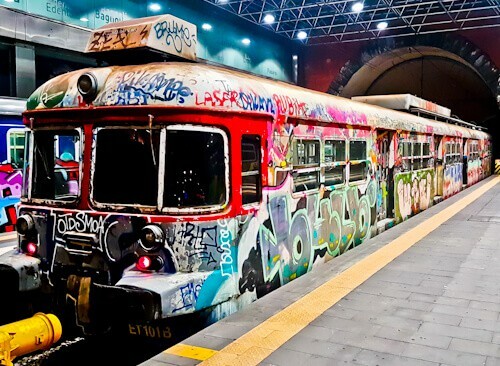 From the center of Naples you can take the train from Montesanto station. After riding 3 stops you’ll arrive at Mostra station. When you exit the station you’ll see the huge San Paolo stadium. There will be street vendors selling food and merchandise, remember you can bargain the price! Where to stay in Naples and Things to do in Naples. I hope Napoli win Serie A this year. I’m glad they beat Milan 2-1 when you watched them. I saw the Maradona flag in the crowd, it must have been amazing watching him play there back in the day! I hope they win Serie A as well – so I can say I watched them play the season they won! What a cool looking stadium from the outside! I’ve only seen it TV and the interior. It’s interesting you can bargain the street food prices outside! Hi Will, and such a historic stadium as well. 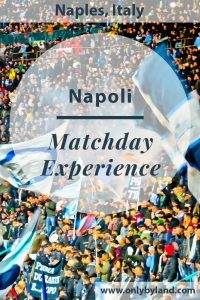 A must visit even if you’re not a Napoli fan!